So, I was wondering why is Robin happy to see you. I’ve been about the San Diego convention center a few times when ComicCon was on. Does nothing for me. But certainly some of the people all costumed up are amazing. Especially the teenagers. Brilliant efforts for sure. this image is possibly from a blog post in 2010, so these kids are long past puberty by now. I assume the bow is unstringed given the typical prohibition against weapons at cons. 😎I always wanted Robin to be younger & cuter. The long hair is a nice touch but it wouldn’t have helped the original Robin! That’a not Batman’s “Robin”, the costume is all wrong! 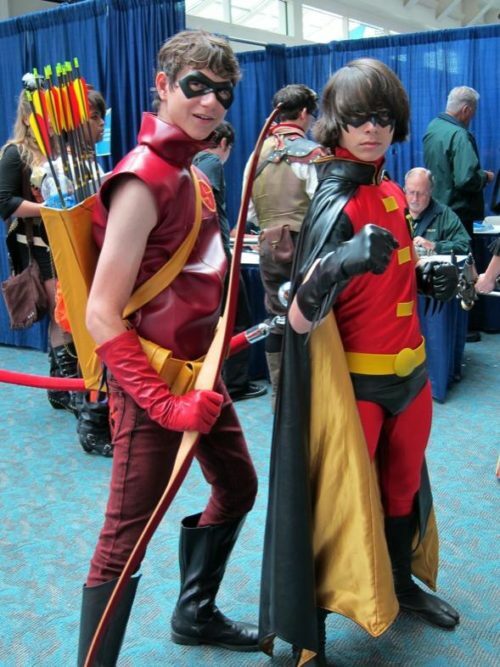 There was some other older Archer & his sidekick was also named “Robin”. LOL Way back when I was a kid myself.